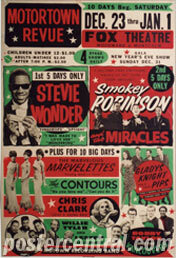 I will pay top dollar for original various-artists 1960s concert posters like these: Supersonic Attractions Present The Battle of the Century! 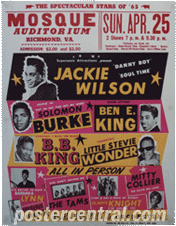 in Knoxville, TN, Oct. 4, 1961; the Motortown Revue in Toledo, OH, Nov. 5, 1963; Supersonic Attractions Presents The Spectacular Stars of ’65 in Richmond, VA, Apr. 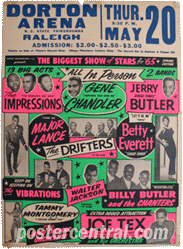 25, 1965; Super Enterprises, Inc. Presents The Biggest Show of Stars for ’65 (Spring Edition) in Raleigh, NC, May 20, 1965; the Motortown Revue in Detroit, Mi, Dec. 23, 1967 to Jan. 1, 1968; and APO Shows Presents The June Jamboree in Greensboro, NC, June 9, 1968. 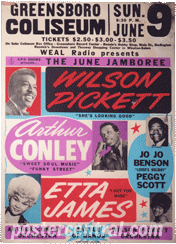 These six great examples of multi-act 1960s concert posters are all original, all printed before the event for the sole purpose of selling tickets. 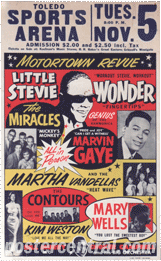 They feature artists like Little Stevie Wonder, Marvin Gaye, Jerry Lee Lewis, Smokey Robinson, The Miracles, Martha and the Vandellas, Bo Diddley, B.B. 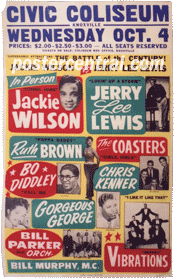 King, The Marvelettes, The Coasters, Ruth Brown, Etta James, Mary Wells, Ben E. King and a host of others. The unsung MCs and bandleaders include Choker Campbell and his Big Orchestra, Bill Murry, Paul “Hucklebuck” Williams, King Coleman, the Bill Parker Orchestra, Bill Murphy, and Gorgeous George.